T.H. 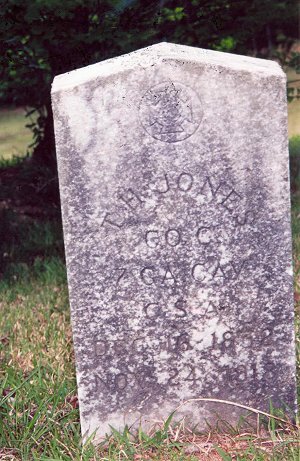 Jones, born in Habersham County, Ga., enlisted in Hall County, June 1862 and served as a private in Co. B, 24th Battalion, Georgia Cavalry. Through consolidation of units, on February 13, 1864 was transferred to Co. C, 7th Regiment, Georgia Cavalry. Pvt. Jones surrendered March 1865 while on horse detail.